Hello! 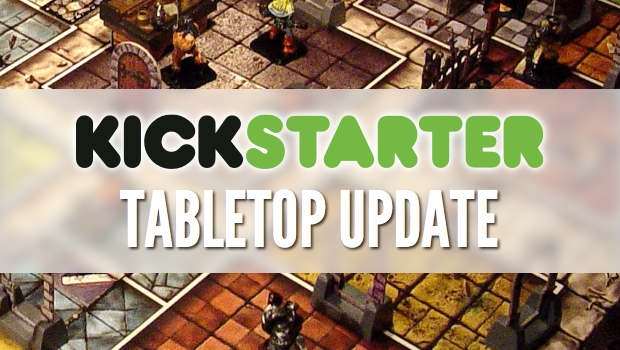 Welcome to Friday Tabletop Kickstarter Update! For info on what is going on here, check out this introduction. This feels like the international edition of the update. Some may be published in other countries, but they are still some great looking games. Remember that I am in no way endorsing these games, I have not played them, I have not talked to the publishers. Back at your own risk. In A World Of takes the two best things about Dinosaurs and presents them in one of the most logical ways. On one board, players influence the survival and movement of the prehistoric beasts and depending on where they die off, they show up as fossils on the other board. I love the idea, I love the art. I am excited to see where they go with In A World Of. Dragon Racer jumps in to the card drafting party with a game that looks like a nice in-between, looking a little more in depth than Sushi Go, and a little more accessible than 7 Wonders. Players draft the cards they need for the next leg of the race trying to out beat their opponents. Plenty of art and gameplay videos are posted to give you an idea if it is a game for you. I first saw Black Hat being demoed by the Arctic Union guys at Essen this past October, where it was getting a fair amount of attention. In the game, players are trying to get through a visualized computer system, sneaking past various network security measures. They have done their homework and have posted quite a few reviews to help your choice. Backing New Bedford was a no-brainer for me. Historic theme, worker placement, push your luck and to top it off, is based on a town right down the road from me. Dice Hate Me games is becoming one of the perennial favorites of Kickstarter, gaining a reputation for high quality, fun games. If you like eurogames, you should go back New Bedford now. Genre: Dice placement, artifact hunting, Adventure! Ryan Laukant has a long list of successful kickstarter games under his designing and publishing belt, and is adding one more. Artifacts, Inc. is lighter fare than some of his past games like Empires of the Void and City of Iron. In Artifacts, Inc. players use dice to set out on wild adventures to collect the best and most prestigious artifacts. I could not leave this update without at least one steampunk game, this is kickstarter after all! Captain’s Wager is all about bluffing and betting. I am still a little unsure as to how the game is played, but they do have the rules posted. Plenty of evocative art to get anyone’s interest.